It seemed like just yesterday (well, technically it was) that Singapore-made app Carousell announced an additional US$35 million funding – the largest in the mobile classifieds space. The app’s currently reported to have over 35 million listings and more than 70 new ones made per minute, and with the funding planned to be used for its growth into new markets and to bolster its product, Carousell’s brand of e-commerce is set to take over more regions. The popularity and potential growth of the app is no mystery – its simple interface and low, almost non-existent barriers to entry makes it an attractive platform for many, especially the younger crowds, to sell either used or new items. Since these transactions can range from large (like motorbikes) to small (like tickets), many tend to opt for brief meet ups to exchange the goods – mostly at MRT stations. This doesn’t only apply to Carousell, but to blogshops or those dealing on e-commerce platforms as well. From personal observation, I’ve seen transactions being made either over the barrier (so one doesn’t need to tap out), near the ticketing area or even on the platform! For my sole experience, the brief meet up was done at a waiting area near the ticketing machines. 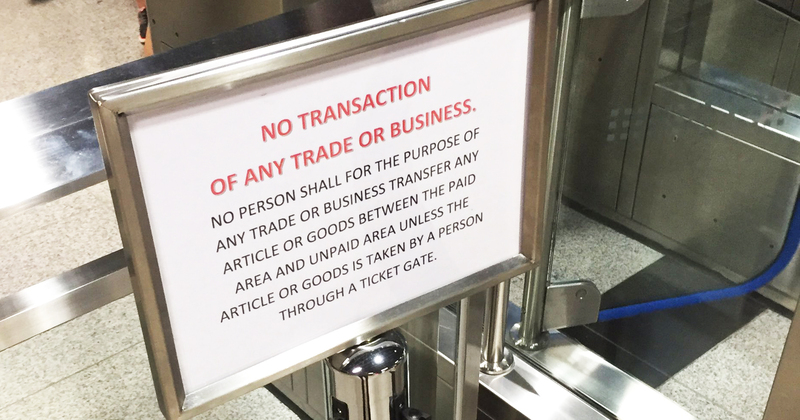 However, not many of us know that transactions done over the glass barriers are actually prohibited, according to rules set by the Rapid Transit Systems in Singapore. And as the rules of social media in Singapore goes, this Twitter post inevitably went viral. Spotted by Xavier Lur at the Beauty World station on the Downtown Line, he, like many of us, was unaware of the rule until it appeared as a signage at the station. To be honest, I think even if it were a signage, many would be too busy to take notice of it! Regardless, the rule is actually not anything new, and had the Land Transport Authority (LTA) had actually mentioned about it in a response to a forum letter in January 2014. What the stance basically dictates is that both buyer and seller needs to be tapped in or tapped out of the gates before their transactions are ‘allowed’. In simple terms – both, or at least one of the parties would be paying for a fare. In a bid to address the buzz the post had caused, The Straits Times promptly reported on it, including SBS Transit’s, the operator for the Downtown Line, response to the issue. LTA also explained that the rule exists “to discourage people from using public transportation for commercial goods delivery, since bus and train services are meant for carrying passengers”. Singapore’s other train operator, SMRT, declined to comment on the issue. Taking LTA and SBS Transit’s reasonings into consideration, if they did not want these transactions to add to the congestion at stations, what about those who are simply waiting around for their friends or relatives at stations? Would those be eventually prohibited too? Regardless, I guess what this means for now is that those looking to conduct transactions at MRT stations need to meet on either side of the gates. What do you think about the news? Let us know!